Please note that due to continued construction and as part of the project for Bohn Park and nearby trail improvements, the pedestrian trail east of the 2nd Ave. bridge to the Black Bear Hole will be closed to the public through June 23rd. Crews will be widening the trail and completing additional infrastructure work in the area. Please assist by staying off the trail during construction. Thank you! The Lyons River Run 5k kicks off Good Old Days! Join this fun, family event. The race starts promptly at 8:00AM in Sandstone Park. The course loops along the river, through neighborhoods and Bohn Park, finishing at Sandstone Park. Join the fun! Sign up to run online or to volunteer! Join the Town of Lyons, Representative Jonathan Singer, Mayor Sullivan, and more for the official dedication of the LaVern M. Johnson Park, on Saturday June 24th at 11 am. 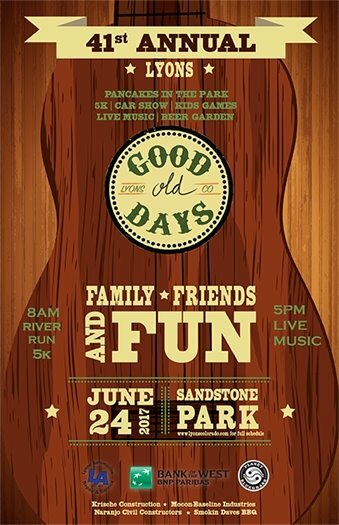 Named after this dear, lifelong resident, who has been greatly involved in the town's parks nearly all her life, the dedication is part of the 41st Annual Lyons Good Old Days celebration. The park was officially renamed in May 2016 by the Lyons Board of Trustees. The grand (re)opening (post flood) was September 9, 2016 which also marked the renaming of the park as LaVern M. Johnson Park. The Town of Lyons is proud to present our new 2017 Goodwill Fund to support human services in the Town of Lyons and the surrounding area. The purpose of the Goodwill Fund is to assist nonprofit organizations that help low-income individuals and families in the Lyons area meet their basic needs. Applications for funding from the Goodwill Fund are accepted June 1 through June 30, 2017. Examples of human service programs include Meals on Wheels, health-related services, at-risk youth support, senior services, childcare assistance, nutritional support, transportation, and programs that assist with other necessary expenses to help households maintain housing, medical care, and utilities. For the 2017 grant cycle, $8,000 total is available for the Goodwill Fund. All funds will be distributed to nonprofit organizations. The Town of Lyons Human Services and Aging Commission will coordinate the Goodwill Fund and determine the amounts distributed to applicants on a case-by-case basis. Sheriff Joe Pelle, in consultation with Victoria Simonsen, the Lyons Town Administrator, and Lyons Fire Chief J.J. Hoffman, has concluded that the water flow rates in the Saint Vrain creeks, which converge into the Saint Vrain River, have sufficiently slowed to rates where the tubing ban can be rescinded. The tubing ban was rescinded effective June 15. Although the tubing ban has been rescinded, the Boulder County Sheriff still encourages people recreating on the Saint Vrain, and all bodies of water, to exercise caution and wear personal protection equipment including a life jacket.